Unfortunately, there is no cure for dementia, so the main goals of treatment are to maintain quality of life, maximise function in daily activities, enhance recognition, mood and behaviour, foster a safe environment, and promote social engagement. Consideration of both pharmacological and non-pharmacological interventions is recommended. It is important to communicate to patients and their families what the expected modest benefits of these medications are, and the fact that decline will continue despite the medication provided. After starting a medication, patients should be regularly reassessed. This should include standardised tests of cognition and function to determine the medication's effectiveness and possible side-effects (and drug interactions relating to the use of multiple medications. Carers or family members should ideally also be consulted. Regular reviews of the patient's general practice dementia management/care plan is recommended and ensure that your patient and their family/carers are empowered with information about their medications in order that they can make informed decisions concerning their own health. Cholinisterase Inhibitors are the most commonly prescribed medications for dementia. There are 3 cholinisterase inhibitors, which include, Donepezil, Galantamine and Rivastigmine. There are no significant differences in effectiveness between the three drugs. Choice depends on availability, cost and side-effects. Adverse effects may be minimised by increasing the dose gradually and ensuring the patients take their medication with a meal. Side effects usually resolve over time or, if necessary, with dose reduction. Patients who do not respond to one acetylcolinersterase inhibitor may respond to another. Monitor patients who have a history of peptic ulcer or who are taking NSAIDS. Monitor patients for bradycardia who are taking B-blockers or other rate slowing medications. Cholinisterase Inhibitors are PBS-listed for patients with mild-to-moderate Alzheimer's Disease. It should be noted that, in Australia, a specialist medical practitioner (neurologist, psycho-geriatrician, geriatrician or psychiatrist) must confirm the diagnosis of Alzheimer's disease in order for a patient to be eligible for subsidised Alzheimer's disease medications. Cholinisterase Inhibitors are not listed on the PBS when used in later stages of AD or other types of dementia (e.g. Lewy body disease, vascular dementia). However, there are clinical trials that suggest the drug's effectiveness on this cohort. Memantine is another drug used in assistance for moderately severe Alzheimer's Disease. Memantine is listed for patients with moderately severe Alzheimer's Disease. It should be noted that, in Australia, a specialist medical practitioner (neurologist, psycho-geriatrician, geriatrician or psychiatrist) must confirm the diagnosis of Alzheimer's disease for a patient to be eligible for subsidised Alzheimer's disease medications. There is some evidence the drug may be effective for people with mild to moderate Alzheimer's disease and for people with vascular dementia. However, in Australia it is not yet PBS-approved for these conditions. Risperidone is an atypical antipsychotic drug belonging to the benzisoxazole-derivative class. It is a selective monoaminergic antagonist with high affinity for serotoninergic 5-hydroxytryptamine2, dopaminergic D2 and alpha1-adrenergic receptors. The updated indications for risperidone include treatment (up to 12 weeks) of psychotic symptoms, or persistent agitation or aggression unresponsive to non-pharmacological approaches in patients with moderate to severe dementia of the Alzheimer type. The use of restraints and psychotropic medications in people with dementia. 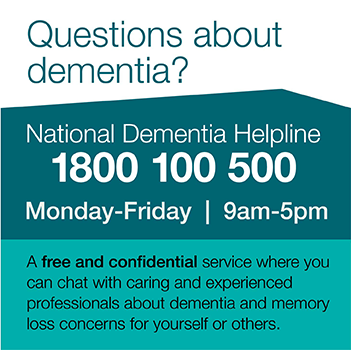 Dementia Australia numbered publications, paper 38, March 2014. People with dementia may be less able to communicate to their carers and health care providers that they are in pain, resulting in reduced quality of life and increased BPSD. This can be avoided by looking out for non-verbal signs of pain and providing adequate treatment. Researchers are looking for new ways to treat Alzheimer's disease and other forms of dementia. To keep abreast of research initiatives, please visit the Dementia Australia Research Foundation. Some patients may be interested in participating in clinical trials or other research studies. Read more about current research occurring in Australia.